At least it does if you’re a connoisseur of games which have really bad bugs. We once spent an entire afternoon trying to get a game to reproduce the caption “Docking completercycle”. As such, this looks magic to our eyes. They should rename it “Stuart Broad v The Netherlands Simulator”. This video’s our favourite. As well as one of the batsmen overtaking the other, watch out for the ominous umpire. What will happen when he makes contact with the fielder near the stumps? The slow build-up’s everything here. Now I feel silly for linking to those in the thread just below a few minutes ago. One of the batsmen ran right THROUGH a fielder! I have had to wipe tears of laughter from my cheeks. Thanks for posting this, KC. Is the fielder nearest the stumps twerking by the end of the second video? I think we need a descriptive term for that movement. 5-7. Is that the first test again? Very briefly. Copies of it must be like collector’s items now. 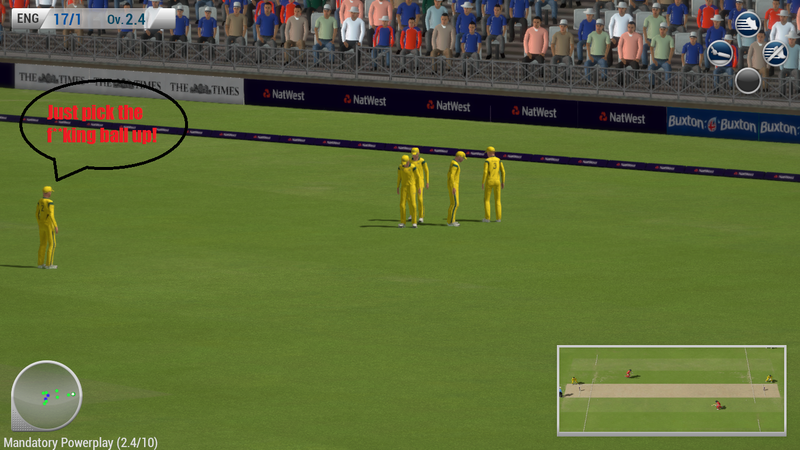 Beyond the game-breaking bugs, it also just wasn’t a good game: there’s no way to control swing, batting buttons have to be pressed basically as the ball leaves the bowler’s hand, you can hit a six off every ball with basically the same risk as defending, bowlers sometimes bowl backwards, wickets get attributed to fielders, etc. The more you watch the second one, the more threatening the looming umpire becomes. 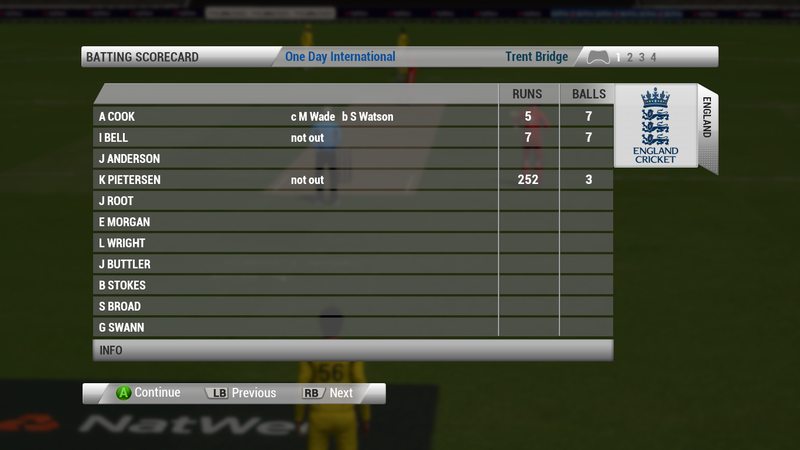 I love the way the batsmen end up running to the same ends. Does it have a post match interview bug which has Mitchell Johnson answering every question with “England are rattled by sledging”? One of the reviews of it mentioned the small fact that it “didn’t have an animation for catching”. If you have a bit of time to invest (and as long as you arent performing major heart surgery or piloting a space shuttle, this is more important) then check out this. 15:20 is my favourite bit. that’s T. Chappell’s famous underarm delivery in the alternate universe. This makes “Springtime For Hitler” pale into insignificance in the pantheon of “so bad it is good” productions. Especially so, as this one is for real. Someone with (presumably) some sort of a brain allowed the product to be released in this state. Perhaps he or she couldn’t stop laughing long enough to pull the plug. Does anyone have a link to a non-You Tube comedy-type review with what sounded like two Americans and a Canadian? Couldn’t get it to play on my phone, and can’t find the with the link in it. It was about an hour long as I recall. I really want to play this. It looks trememndous fun.